I was chosen to host a SuperHeat party, and it was supposed to happen on the 27th. It didn’t go off as well as I hoped it would since we had a hurricane coming our way (I’m actually writing this on the 27th and scheduling it, just in case the power goes out) and everyone was running around all crazy-like trying to get bottled water and what not. But we still had a few people visit, and we’ll be sharing the rest of the cards with Jake’s friends at the bus stop on Monday, assuming that his school doesn’t flood and they still have school. For those who haven’t heard of this game (I never heard of it before I saw the House Party for it), SuperHeat is a brand new trading card game that features awesome pro skateboarders. The basic premise is like other trading card games, which means my six year old could grasp in in five seconds while I’m still trying to understand the instructions. Each starter deck contains: 42 game cards, 1 collector card, a rules poster and a quick start game card. You can also get booster packs, each with 8 game cards and 1 collector card. Jake was particularly excited about those. 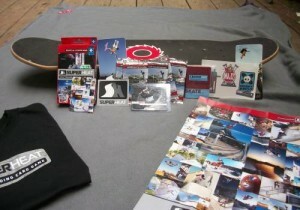 The cards have about 30 different pro skaters on them, from Bob Burnquist to Mike Vallely. None of the ones I remember from my days of hanging around with the skaters are there though, maybe they’re all retired. Jake has been really into skateboarding lately, although he can’t really do much yet. I need to take him to the skate park and see if I can find someone to teach him the basics, since I can’t even balance let alone ride. Like I said, I hung out with the skaters, but I was never one myself. 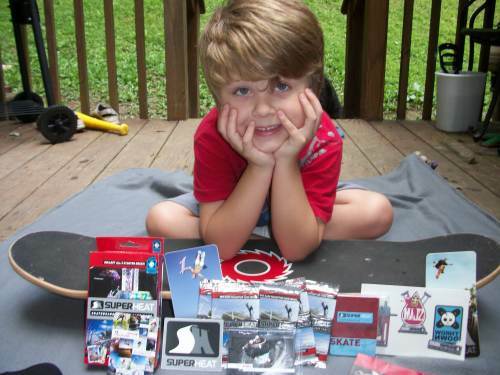 The skateboard in the picture is Jake’s, and not part of the SuperHeat party pack. This would be a fun game for skateboarding fans, and good for parents who are apprehensive about the fantasy-based games but still want to let their kids get in on one of the card-trading fads. I think this is one to watch for the Christmas 2012 season!